Becky Lynch arrives at the venue. Kayla Braxton asks Lynch if she’s ready for Asuka. Lynch thinks the question is dumb, but she’ll answer it in the ring. As Lynch walks away, she happens upon Heavy Machinery and New Day making a pancake and egg smoothie. Otis Dozovic drinks some, but New Day wants no part of it. Lynch takes a swig. She says it’s a little weak. Then she walks away. Becky Lynch heads to the ring. Lynch talks about how the people in the locker room think that what she’s doing is a fluke. They think it’s easy to beat a buzz, to connect to people, and to main event. Also, Asuka is finding out how difficult it is to lead the SmackDown women’s division. People think Lynch is hype, but she delivers every single night. Asuka, however, had a lot of hype prior to Wrestlemania, but she lost. Asuka couldn’t even beat Charlotte, so Asuka wants to know if Becky is ready for her? Asuka heads to the ring. Asuka says Becky likes buzz and hype. She’s like a bee with no sting. After Royal Rumble, Becky won’t be in Charlotte’s shadow, she’ll be in Asuka’s. The IIconics come out to the stage. Billie Kay says Asuka isn’t acting like a true champ. Peyton says Becky is just a bully. But all this nonsense is temporary, no matter what happens between Asuka and Becky, The IIconics will win the Rumble, become the first ever women’s tag champs, and make Wrestlemania iconic. Becky Lynch tells Asuka to pay attention. She’ll show Asuka why the world is talking about her. Becky then challenges either of the IIconics to a match. I liked the match. There was no question who was going to win, but Royce got a surprising amount of offense. I liked how Peyton stepped up, even if this was mostly a warmup for Lynch. Immediately after the match, Asuka enters the ring, screaming at Becky Lynch and The IIconics. Asuka runs over, grabs Billie Kay, and rolls her into the ring. This wasn’t much of a match. It was a response to what Becky Lynch did. The IIconics were props, but at least they got some good airtime (and ring time). After the match, Asuka and Becky argue in the ring. After a few seconds, AJ Styles heads to the ring. Asuka and Becky leave as Styles circles the ring. Styles then goes out into the crowd and heads up the stairs. AJ Styles responds to Daniel Bryan’s concession stand tirade last week by saying that the people can do whatever they want. He then throws some of his shirts from the merch table out into the crowd. Daniel Bryan arrives and starts a brawl. Styles gets the better of Bryan and drives him through a table covered in hot dogs. The Usos are having a photo shoot. The photo shoot is interrupted when someone delivers a present to Jimmy Uso. Jey Uso reads the note with the gift. It’s from Mandy Rose, and the gift is a rose and a key to a hotel room. Pictures of Carmella and R-Truth visiting WWE headquarters. Kayla Braxton welcomes Zelina Vega and Andrade Almas. Almas says he is the future of SmackDown. Vega says Almas is going to win the Rumble and become the new champ at Wrestlemania. Samoa Joe heads to the ring for a match. Mustafa Ali comes out next, but Joe attacks Ali before the opening bell. Joe throws Ali out of the ring and follows him out to the floor. Ali is defenseless as Joe beats on him and throws him all around ringside. Sonya Deville asks Mandy Rose if she wants to go through with giving Jimmy Uso her hotel room key. Rose hates Naomi, and she wants to break up her marriage. Rey Mysterio walks in the back and encounters Nikki Cross. Nikki wants to play. Kayla Braxton asks Samoa Joe why he attacked Mustafa Ali. Joe says that wasn’t an attack, it was a message. Joe will win the Royal Rumble, and the amount of respect he showed to Ali is the same respect he will show to everyone else on Sunday. Great match! 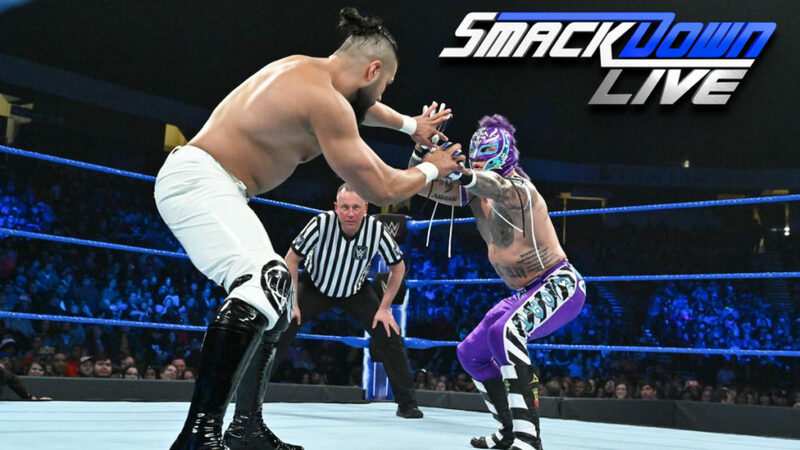 They built on the buzz from the tag match Rey and Andrade were in last week, and they delivered the first great SmackDown match of 2019. This was super fun to watch. It started with both men trying to feel each other out, it moved into a wear-down period, and the last half of the match was all about speed, agility, big moves, and big counters. I loved it. Jimmy Uso enters Mandy Rose’s hotel room. Rose approaches Jimmy and removes her robe. Jimmy says they can’t do this, Rose says they can. A photographer enters the room and takes some pictures. When the photographer leaves, Rose reveals that she never wanted Jimmy, she just wanted photos so she could destroy Naomi’s life. Jimmy leaves, and Naomi enters. Naomi and Rose brawl. Rose eventually gets the better of Naomi and runs away. Jimmy reenters the room and checks on his wife. The Miz heads to the ring. It’s time for the “bestie birthday bash,” so Miz introduces Shane McMahon who heads to the ring. Miz tells Shane that this is no ordinary birthday party. Miz went to Shane’s favorite bakery and got not one, but two specialty cakes. Miz then gives Shane his presents. The first present is a pair of Jordan 33s (they’re shoes). The next gift is a video package of highlights from Shane’s in-ring career (there are a lot of shots of him jumping and falling off of things). The video ends with the formation of the team between Shane and Miz. Shane thanks Miz for the video. He also thanks Miz for his story about his dad. That has made Shane want to share something. Shane has always wanted to be a tag champ, and he is proud to walk into Sunday with Miz has his partner. Miz tells Shane that his dream is going to come true on Sunday. But first, Miz has the arena sing “Happy Birthday” to Shane. The Bar interrupts and comes out to the stage. The Bar says they are going to destroy Shane and Miz. Shane has an idea. If Sheamus thinks he’s so tough, why doesn’t he fight Miz one on one, tonight. Miz says he’s not dressed to wrestle, but Shane says he wasn’t dressed to wrestle when he won the WWE World Cup. Miz finally agrees to the match if that’s what Shane really wants for his birthday. This was barely a match. It was short, and Sheamus was mostly dominant. The finish involved shenanigans (and a table with a cake). After the match, Sheamus attacks Miz. Shane helps Miz, and Miz hits Sheamus with the Skull Crushing Finale. Miz sets up Sheamus in the corner, then he holds a cake on Sheamus so Shane can go coast to coast and kick it in Sheamus’ face. Miz and Shane then hold up the Best in the World trophy together. The highlight of the night was definitely the Mysterio/Almas match. That was the centerpiece, but some of the other stuff didn’t quite hold my attention. I did not like the Jimmy/Rose/Naomi stuff at all. The story wasn’t great, but it was even worse because of how it was handled. I don’t think anyone ever believed that Jimmy would cheat on Naomi, so where was the tension? But on top of that (and even worse), how are we supposed to believe that any of this is real when there are multiple cameras following all of these people everywhere they go? Rose wanted pictures to frame Jimmy? Then why not just show her a video SmackDown? Why would Rose talk about her plan in front of a camera? If we were to believe that Jimmy was really going to the hotel room to cheat on Naomi, then why would he have a camera follow him? How are we supposed to believe that there were at least two cameras in basically the same position in Rose’s hotel room (because there were multiple camera edits in that segment). It’s dumb. It’s dumb like the segment where Alexa Bliss was walked in on in her dressing room. Dumb! I liked the Becky Lynch stuff, though I kind of hope Asuka retains the title at Royal Rumble. I feel like Becky versus Ronda is the way to go for Wrestlemania, and that doesn’t need to be champ versus champ. Also, I think having Asuka make it past Becky Lynch will help build up some of the credibility that was maybe lost when Asuka basically didn’t do anything for most of 2018. The Bryan/Styles stuff is fine. That will be a good match regardless of whatever story they have going on. I don’t care about Shane and Miz, I just hope they don’t win the titles. Miz and Shane need to have a falling out, and losing to The Bar could start that rift. Plus, Miz repeatedly goads Shane into doing the coast to coast even though it clearly hurts Shane every time he does it. That should probably annoy Shane at least a little. Did I mention that I really enjoyed Andrade versus Mysterio? Yeah, it’s great. I could watch them wrestle again and again. Great stuff. Andrade might finally be starting to fulfill his role as the future of SmackDown.